Weather and other occupations didn't allow me much observing the past two weeks. I did get a few positions last week, on the 8th and 11th. On the 8th it were Lacrosse 2 (91-017A) and three of the NOSS-2-3 components (96-029C, D & E). Yesterday (the 11th) it wereIGS1A and 1B (03-009A & B). 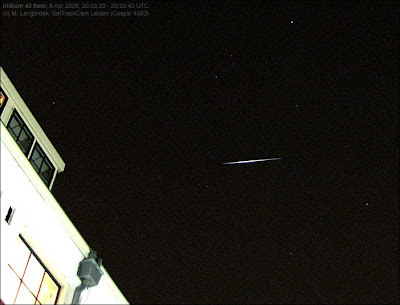 I also made a few photographs of Iridium flares with the new Ixus 75 camera. Two of them are shown below. So far, it seems my new camera has a timing lag of 0.9 seconds. Unlike the Ixus 400, the 10 second exposure setting really is 10 seconds. The Ixus 75 images are much sharper than those of the Ixus 400. I have some suspicion though that they show less faint stars than the Ixus 400 images. 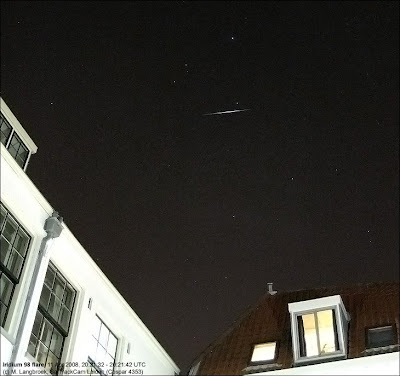 Below are two Iridium flare pictures (Iridium 43 on the 8th, and Iridium 98 on the 11th). Also given are their brightness profiles.